Take the best bits of the classic Western, mix in the spices of ancient Roman intrigue, and add a pinch of Tolkien and a sprig of steampunk. 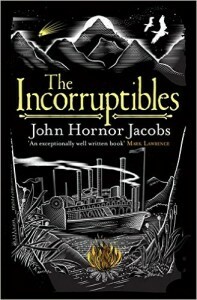 Leave to simmer for 303 pages, and you’ve got yourself John Hornor Jacobs’ The Incorruptibles. Fisk and Shoe don’t want complications. Employed to guard a high-ranking nobleman and his family as they make their way upriver on a demon-powered steamer, they are quite content to keep their heads down and do what they have to do to make a living. But, of course, the fates and the gods themselves conspire against them and, before they know it, they’re highly embroiled in the lives and politics of their employers, and a battle between the humans and the elven creatures that haunt the shores. 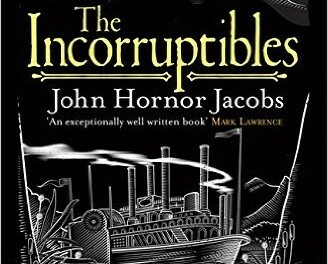 The Incorruptibles is a breath of fresh air in a fantasy genre saturated with epic fantasies told across medieval-styled hills and dales, where intrigue is centred around the courts of kings and queens and their knights. The plot of this novel is not overly complex, yet the originality of the world that has been built, and the strength of the characters, make the novel feel as well-crafted as many epic fantasies twice the length of this book. Another interesting twist that this book brings to the genre is the fact that the story is told using a first-person viewpoint that does not belong to the main protagonist. This provides an unusual sense of detachment from some of the main events of the novel; a technique which has high potential to leave the storytelling feeling flat or awkward. But, here, it works. Imagine, for comparison, Frodo’s story within The Lord of the Rings told solely from Sam’s perspective. 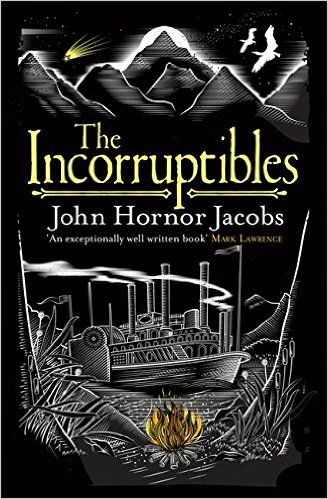 The Incorruptibles’ protagonist, Fisk, goes on a very similar journey to Frodo, complete with a literal burden tied about his neck, but instead of hearing first hand the effects of his task we instead see them through the eyes of a friend. We don’t hear about Fisk’s motivations for doing what he does, nor are we privy to his innermost thoughts, but we don’t need to be; Shoe observes enough for the reader to understand. It is a masterclass in the writer’s favourite mantra of “show, don’t tell”. The characterisation is spot on throughout, and even the more minor characters are well-developed, leading to a strong sense that all these people who come into Fisk and Shoe’s lives have stories of their own to tell. And there is, clearly, a lot of story left to tell, with the final pages setting up nicely for the second book in the series. However, there’s still more than enough closure to satisfy readers for the time being whilst we eagerly await Fisk and Shoe’s next adventure.